Amazon has unveiled a new generation of its Echo smart speakers with Alexa. 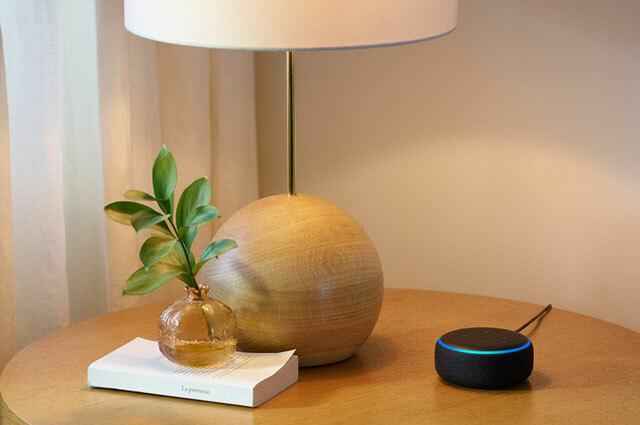 As well as new Echo Dot and Echo Plus models, the company has announced a new subwoofer and a device to add Alexa to existing non-Amazon speakers. The new Echo Dot swaps the plastic exterior for a fabric design, like the Google Home devices. Amazon says it features a new speaker with louder and crisper sound. Replacing the black and white versions, the new speaker comes in Charcoal, Heather Grey and Sandstone. Pricing for the Echo Dot is unchanged at £49.99. Amazon has also updated the Echo Plus with a new speaker and design. The new Echo Plus has a built-in Zigbee smart home hub, allowing easier set up of compatible smart home devices. The speaker now has a built-in temperature sensor. This means the speaker can activate routines using other smart home devices based on the temperature. The new Echo Plus comes with a 3” Neodymium woofer. Amazon says the increased back volume means that “the bass feels stronger and the mids and highs are clearer”. It comes in the same colours as the new Echo Dot. For owners of connected and non-smart speakers Amazon has announced the Echo Input. This device connects to existing speakers with a 3.5mm audio cable or Bluetooth. Although it doesn’t have its own speaker, it does feature microphones for use with Alexa. When the device is connected to a speaker it can be added to a new or existing multi-room music group. For improved bass when streaming music the new Echo Sub wireless subwoofer can be added to existing Echo devices. This creates a 1.1 or 2.1 system when added to two existing Echo speakers. An equaliser feature in the Alexa app makes it possible to adjust the bass, mid-range and treble. The company also unveiled a range of other Echo companion devices. The Amazon Smart Plug can be used to switch on lights, coffee makers and other devices. Other new audio devices announced include the Echo Link, which connects to a hi-fi system to stream “high-fidelity music” and Echo Link Amp. The latter includes a 60W, 2-channel built-in amplifier to use with active or passive speakers. No UK availability has been announced for the Link products. Echo Auto adds Amazon’s Alexa to cars with Bluetooth, and is only available by invitation in the US. Customers in the US will also be able to buy an Echo Wall Clock and AmazonBasics Microwave.